We are in the midst of a major remodeling project in our home as it is made wheelchair-friendly. Doors are being widened, our closet is being reconfigured so I can reach my hanging clothes, and our bathroom’s tub and step-in shower are being replaced by a roll-in shower. 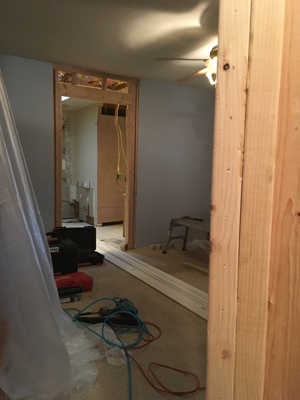 I have been struck by the similarities between remodeling a home and remodeling a soul—otherwise known as the sanctification process. Sanctification means “being made holy,” and holy means set apart. I am being set apart for God’s kingdom, for His purposes, and with a plan to make me into the image of His own dear Son (Romans 8:29). When God is doing the remodeling, He takes into account how we were designed and built (by Himself!). He knows how much stress we can take, and won’t violate His own design for us. Just as He promises us not to allow us to be tempted beyond what we are able (1 Cor 10:13), He always remembers that we are but dust (Psalm 103:14), and He knows our limits. The trim around doors was pulled out, and sections of sheet rock were cut out and removed. The garden tub was cut up and hauled away, and the huge mirror over it is now gone. The glass shower was taken out. I’ve noticed that part of the sanctification process means God removes the old things in our hearts that have outlived their usefulness—things like coping strategies and childish ways of thinking and living. In order to grow us up to maturity, the old has to go. They parked a trailer outside our back door, and it was soon filled with sheet rock, wood, marble and glass that needed to be taken to the city dump because it was trash. I mentioned this to the man in charge, who cheerfully agreed that “You gotta get rid of the ugly!” Since I also shared with him my thoughts about the parallel to sanctification, he laughed with me that that’s what God does: He gets rid of our ugly. He targets anything that’s not glorifying to Himself or helpful to us, and pulls it out. Or calls us to let it go into His hands. This made me realize that God knows the best order for addressing issues in our lives that need to be changed. Like knowing which are the load-bearing walls, He knows what needs to wait until He deals with other problems first. For example, we often want Him to get rid of nasty habits or addictions, but He’s more interested in working on our hearts so that the change in our behaviors is a more (super)natural, organic result of growth. Remodeling a house means a lot of inconvenience. I have to go to a gym that has a roll-in shower because our other shower is in a bathtub, and I can’t climb in and out of bathtubs anymore. We are having trouble finding some things that were moved temporarily. There is dust everywhere. I can’t have people over very easily. These are all temporary, but they are still inconvenient. God’s remodeling process also feels inconvenient because there are so many adjustments to new ways of thinking and reacting and living. We have to practice new ways of thinking when God makes changes in our belief system and our trust system. Adjustment means change, and change is rarely convenient! And just as I need to trust the architect of our home remodel, even more I need to trust my Father, who knows what He’s doing in remodeling my soul and does it all well . . . and in love. This blog post originally appeared at blogs.bible.org/engage/sue_bohlin/remodeling_a_home–and_a_soul on May 2, 2017.